Easy to order and track progress. Some glasses are shown in stock and it takes a couple of days to say they're not. Delivery was a faster than previous orders. It took me a month, but I am satisfied with the service. I wear Oakley since a long time and it is sad to see the quality drop so bad. Once Oakley was sold to lux the quality remained for several years but all the newer models are not matching old Oakley standards. The rimless models are even worse (for example keel) which use the same plastic part that all lux frames usw to secure the lenses which fall off quite often (the older Oakleys used screws which last for ages (WHY series for example and the last one was the EVADE) I just tell this because the PITCHMAN is a good example for the bad quality too. To be fair Oakley is way cheaper these days but design is not that special as it used to be in every single model (they make more models just for the mass market that don't have much more special than an O on the side) and quality is just on par with other lux stuff, which is not a good thing (I never had to match right and left earpiece on any older Oakley, the newer ones are never identical, in this case my right was nearly straight and the left curved). The nosepads are transparent but made of the same material and just glued on, this is just to make the tools cheaper. Most important thing is does it fit your face and if it does and you like the look of this rather sporty casual frame there is not much reason not to buy it. Don't buy them for sports as this are pretty stiff frames. You can get better quality but not for this look. One plus is the weight, these are really light frames considering the size. 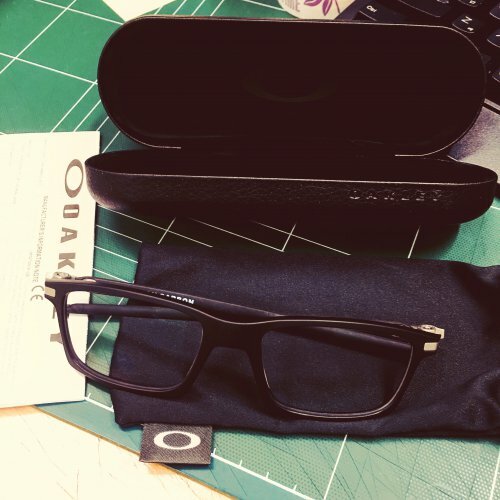 I got the 1.61 glasses and wonder if they are Essilor, whatever they are they are solid performer, I could create some flare but this is very rare in normal conditions.